How Much Revenue Can Google Fi Add To Alphabet’s Top Line? How Will Focus On Cloud Impact Google’s 2019? How Will Alphabet Perform In The Second Half Of 2018 After Solid Q2 Growth? In our previous note, we explored the online advertising industry in the U.S. To summarize, the digital advertising market in the U.S. is forecast to grow at a CAGR of 11.3% during 2015 and 2019 to reach $103.3 billion, according to Forrester Research. 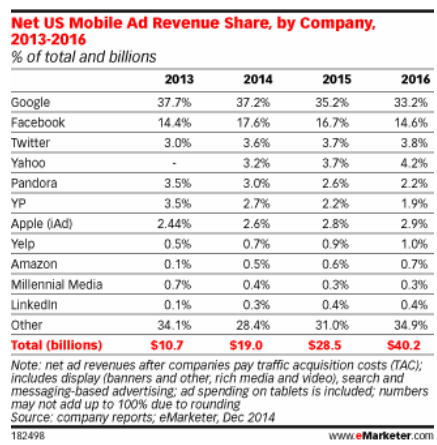 Search marketing will continue to account for the highest share in the overall U.S. digital advertising budget. However, the future growth in the digital advertising market will be fueled by mobile ads, as the platform is still highly under-penetrated within brand marketing budgets, as compared to the amount of time spent on mobile devices. In this note, we explore the advertizing industry in detail, and look at the various participants in the industry. With the heightened Internet penetration in the U.S. and proliferation of content, especially user-generated content, the digital advertising market has taken center-stage in the advertising industry. Furthermore, users frequently consult the Internet before finalizing their purchase. As a result, the competition in the industry has increased tenfold. Companies currently operate a broad spectrum of services ranging from search engine advertising, which includes behemoth Google, to analytics. However, digital ad companies are focusing on grabbing the most eyeballs for their content partners. While Google continues to lead the search ads industry in the U.S., Facebook has emerged as the most dominant company in the display ads vertical. However, Google is trying to undercut Facebook’s dominance (especially increasing popularity of videos on Facebook) by increasing the reach of YouTube, which is one of the most dominant online video content providers on the Internet. Google is focusing on channelization of YouTube that will boost the unique user count as viewership for YouTube will rise. The number of unique visitors is vital for Google’s ad revenues as more people visiting the website generally translate into more pages viewed across Google’s websites. A comparison of the two companies core financial metrics, shows that while Facebook’s EBIT grew 78% in 2014 year over year, that of Google’s rose at 18%. While Google is trying to explore different avenues such as the local ads vertical through Google Glass or increasing Internet reach to untapped regions in the world, Facebook is leveraging its growing popularity by introducing new ad formats such as in-stream ads. Google’s market share in PC and mobile search markets is over 60% and 85% respectively. Google’s strong share in digital advertising, and in particular the mobile search market, bodes well for the company, as this segment is expected to witness high growth. This is expected to translate into high cash flow growth for Google in the future. With around 210 million monthly active users within the U.S. and Canada, Facebook is positioned as one of the leading companies in the region’s display ad market. The company’s revenues from the U.S. and Canada were seen at over $5 billion over the last year. With the social network currently prioritizing on videos, we expect Facebook’s market position to further improve in the coming years. Video views on FB recently surged to four billion per day as compared to just one billion in September 2014. Hence, we expect Facebook to take some market share away from YouTube as its online video business is fast gaining popularity. Since online video remains a fast growing segment within the overall digital ad market, we expect this to translate into high-revenue growth rate for the company. Our $87.83 price estimate for FB’s stock and $547 price estimate for Google’s stock, are broadly in line with the current market price.